The first bear I made this year, back in January, was sort of a treat for myself. (I collect Teddies, too! )I was enjoying listening to A Bear Called Paddington on CD with my son, and we decided to make our very own versions of Paddington. 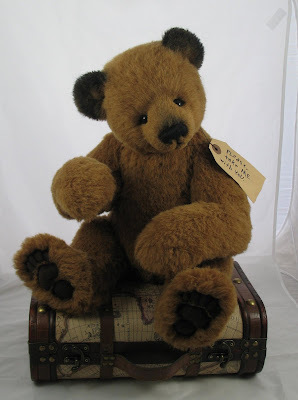 Brendan did a great job with his Paddington, his first Teddy Bear, and I was delighted with the way mine turned out, too. It turns out so were some of my collectors--a few have asked for one of their own. Paddington is a licenced character and, as such, getting permission to make him to sell would require me to change my design to fit with the popular image of Paddington. Rather than change my bear, I have changed the name. Meet the Traveling Bear. This is the second bear made with this design, since the first is staying with me. 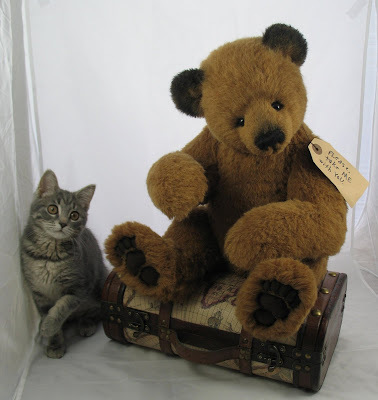 (*smile*)This near-life sized (23")cub is made of dense brown alpaca with airbrush accents. He is five way jointed and his arms contain wire armature for additional posing. Special features include appliqued-trapunto sculpted pawpads and a needle sculpted face. His eyes are glass. 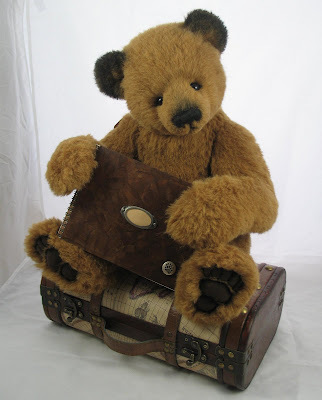 Like Paddington, he is an orphan who loves traveling, geography, and keeps a scrapbook of his adventures. His little tag reads "Please Take Me With You", and his suitcase is covered with maps. 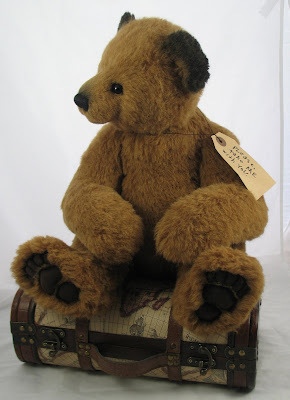 Also like Paddington, it will be up to his new adoptive family to find him the perfect name, and to take him on many adventure to fill his scrapbook and fill his suitcase with souvenirs. As much as I was trying NOT to get Missy in the photos, I had to post this one!!! How cute is that little pose?! It's like she's thinking, "Tami, all you want to do is photograph bears--Look, I can be adorable too!" 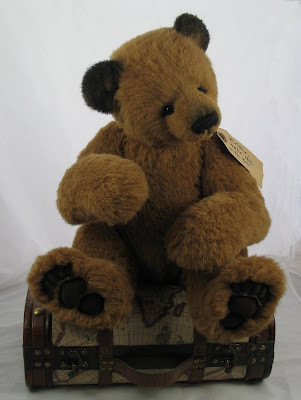 Your new bear is beautiful! Your kitty is sweet also.